River Oaks' State of Grace offers a menu reminiscent of old-time Houston restaurants and modern raw bars. 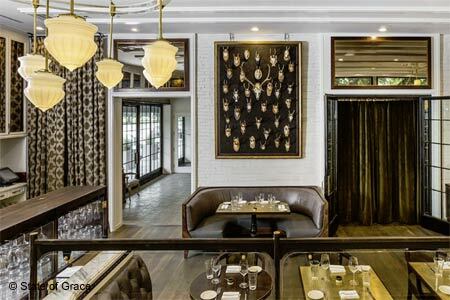 About the restaurant: Atlanta-based chef Ford Fry returned to his hometown to open State of Grace in River Oaks. Fry partnered with local chef Bobby Matos, and the duo has created a menu reminiscent of old-time Houston restaurants and modern raw bars. The space, in a strip center across the street from Fry's old high school, combines a trio of former businesses into one large restaurant with a long bar, chandelier, comfortable booths and horns on the wall. The bar dining room makes for great people-watching, but the best seats are at the chef's counter in the kitchen (note that it can get a little warm with the wood-burning hearth) or the oyster bar up front with its big bay window. Food & Drinks: Start with hushpuppies and a couple of cold oysters. What comes next could be anything from the burger cooked in butter to cheese enchiladas or the twice-fried Korean chicken; there are also a few pastas and pork chop schnitzel. Just save room for some sticky toffee pudding with malt ice cream. Sunday brunch brings a slew of temptations, including warm cinnamon rolls, Gulf shrimp omelets and crawfish Benedict. Cocktails favor Texas-made liquors and there's a good wine list with some lovely whites to pair with the seafood.